does anyone have further information about the dark blue Stratocaster Chris played in the 80s? I've only seen him using this guitar in 1986 - not before, not after. Some say it is in the colour "Lake Placid Blue" but to me it looks different, less metallic and darker. What happened to it? And what about the second red Stratocaster - does it really exist? I was told the second one was tuned in standard tuning ("Pinky" is tuned in open-E tuning, EBEG#BE) and there is a video on Youtube from the '85 Concert at Lorelei where he played "Josephine" with a red Strat which could be this guitar - because "Josephine" has no slide guitar in it and the solo is in standard tuning. But it looks very, very similar to "Pinky" and in 2014 he played "On The Beach" also on "Pinky" at a few gigs. thanks for raising this issue, this all also has been puzzling me over the years. First I thought it was his Bluey guitar in another (original) paint, as Chris tells in an interview it was dark-blue when he bought it (wishing for a Ry Cooder style guitar). But now that I am not quite sure and sometimes it seems to me that dark blue one is another guitar and it sounds different to Bluey. I hear it in slow live versions of Josephine, for example. I think that here Chris also mentions buying Bluey in early 1986. And here is the more peculiar picture of Chris from 1985, where he seems to play live with a Telecaster! thanks again for your effort, I appreciate it. Marvellous pictures as well. Your theory of a repainted "Bluey" is very interesting - never thought of that. I've also read the '86 interview you provided the link for and was even more confused. In his excellent video that came with his signature guitar from Fender he talked about this incident but said that it was the very guitar he is still playing. No mention of a second pink one that was also affected. So either both pink guitars were exposed to water and only one survived - the one he is still playing today - or they were able to save "Pinky" and he stopped using the second one at osme point. If I remember correctly some years ago I saw pictures from an official auction in which Chris gave away one of his pink Stratocasters (can't find it anymore). Another interesting thing: Chris said that "Pinky" was originally more of a Candy Apple Red than pinkish but in '62 CAR was not listed an optional colour and it would have sparkled, too. So he must be wrong. thanks a lot for your further comments on this subject! tobi777 wrote: I've also read the '86 interview you provided the link for and was even more confused. In his excellent video that came with his signature guitar from Fender he talked about this incident but said that it was the very guitar he is still playing. No mention of a second pink one that was also affected. I agree, it is unclear from 1986 interview what happened to each guitar. Chris tells in this article he actually uses 2 strats (not mentioning the colour) when speaking about Pinky. He also points out that, after trying various guitars, he got stuck to 2 strats at that moment, but does not mention which ones exactly. He also tells about a "really hard blue strat he just acquired" and I suspect he speaks about the dark-blue one he first played in 1985. It seems that he must be talking 'bout Bluey and Pinky there, after all, especially if the dark-blue strat really is Bluey. I assume in 1985 Chris was still trying to find a proper guitar for standard tuning, and the 2nd pink strat (in standard tuning) at Lorelei was a substitution for the dark blue one seen at Montreux Golden Rose. I also think that it is Pinky, his main guitar from 1980, which he regrets that much being suffered from the flood, but it seems it survived and got back for good in the end; and the 2nd red strat did not and it was not that valuable to revive, so it was replaced with the blue one. I aso remember the words of Tommy Willis, CR's guitar tech, that when he started working with Chris, presumably in 1987, Chris had only 2 main guitars, the red one and the blue one. toby777 wrote: Another interesting thing: Chris said that "Pinky" was originally more of a Candy Apple Red than pinkish but in '62 CAR was not listed an optional colour and it would have sparkled, too. So he must be wrong. Thank you for this deep insight on model years and colour line-ups! Yes, Chris may be wrong in defining the color, he often tends to be inaccurate in his memories, so either building year (1962) is incorrect (which I doubt) or the original color is slightly different, but I do believe it was not pink originally and the bright red colour faded with time. BTW, that is why I assume dark-blue guitar is Bluey - it also lost its bright color at some point (but was not repainted). toby777 wrote: If I remember correctly some years ago I saw pictures from an official auction in which Chris gave away one of his pink Stratocasters (can't find it anymore). I can hardly recall anything like that, but I strongly suspect it was 1999 CR Signature strat that was put on that auction, or just another new built strat in a suitable colour (that Chris might use for a while). It appears to have been BLACK originally, but seems Chris to get it in Lake Placid Blue, just like Ry Cooder's '62 strat he admired. So it really seems that Lake Placid Blue coloured strat later become light-coloured Bluey, always used for standard tuning. tobi777 wrote: If I remember correctly some years ago I saw pictures from an official auction in which Chris gave away one of his pink Stratocasters (can't find it anymore). I am pretty sure it is the charity event you were talking about. I think it was an official auction like Christie's or Sotheby's but maybe my memory is cheating me. Another curious fact: On the Facebook group page (Chris Rea fans) is a pic of Chris with "Bluey" and you can clearly see that the logo and other parts of the the headstock decal are nearly gone. On newer pics the headstock looks complete and nearly good as new. Maybe he changed the neck or there are different "Blueys"? That would explain why the dark blue colour never looked "right" to me - regarding the Fender colour charts. But the black tape he put on the light blue guitar after 2000 after his illness - and at that time the guitar had been light blue already. BTW I don't believe that the Lake Placid Blue faded into the light blue that fast - in just one year from '86 to '87! Additionally it would be very unusual because fading is always irregular and Lake Placid Blue tends to get more greenish - and also only after many years of exposure to sunlight etc. - but it never gets that light colour. So either it was really refinished and that explains why "Bluey" still looks good after all these years - or we are talking about two different guitars and "old Bluey" hasn't been played in public since '87. Maybe he traded it against the other guitar. thanks a lot once again for your active research on this amazing issue! tobi777 wrote: On the Facebook group page (Chris Rea fans) is a pic of Chris with "Bluey" and you can clearly see that the logo and other parts of the the headstock decal are nearly gone. On newer pics the headstock looks complete and nearly good as new. Maybe he changed the neck or there are different "Blueys"? This is the easiest part of the puzzle - I find it quite evident he simply replaced some parts of the old battered Bluey, including its neck. He said not once that the frets almost lived their days away and the overall neck may not stand a full concert cone day, so that he did not play it much and used the brown strat instead. Now that he finally decided to exchange/renew the neck of the Bluey. tobi777 wrote: It appears to have been BLACK originally, but seems Chris to get it in Lake Placid Blue, just like Ry Cooder's '62 strat he admired. That would explain why the dark blue colour never looked "right" to me - regarding the Fender colour charts. In this case I cannot tell for sure - whether Chris got this guitar in black and made it repainted being its new owner, or he was told that it was once black and Chris bought it as he liked its Ry Cooder-ish colour. tobi777 wrote: But the black tape he put on the light blue guitar after 2000 after his illness - and at that time the guitar had been light blue already. Yes, of course, Bluey had been light blue before being wrapped in black vinyl in 2000-2001. It was also light blue again in 2004, and in 2002-2003 Chris seems to have not used Bluey at all. Please correct me if my memory does not serve well. tobi777 wrote: I don't believe that the Lake Placid Blue faded into the light blue that fast - in just one year from '86 to '87! Additionally it would be very unusual because fading is always irregular and Lake Placid Blue tends to get more greenish - and also only after many years of exposure to sunlight etc. - but it never gets that light colour. Thanks again for the notice about the colour charts and their changes with time, I really lack this knowledge. Yes, this really puzzles me. First I thought the change in colour was due to the flood in Chris's studio, but it was early 1986 and the guitar was still dark-blue in late 1986. I assume Chris got it refurnished after 1986 as he considered it looking too new, not bluesy enough, as he points out in 2001 Guitarist interview. tobi777 wrote: So either it was really refinished and that explains why "Bluey" still looks good after all these years - or we are talking about two different guitars and "old Bluey" hasn't been played in public since '87. Maybe he traded it against the other guitar. After all I still tend to stick to the point that there has always been one single Bluey in different appearances. tobi777 wrote: I guess it is even more confusing. We need high quality pics of both blue guitars and we should ask CR himself. Well, asking Chris himself is guite an unbelievalu thing to do, but we can try to get to his old guitar tech, Tommi Willis, he must know the answer and give even more precise information than Chris, as Chris is always VERY inaccurate when recalling things and events from his distant past. 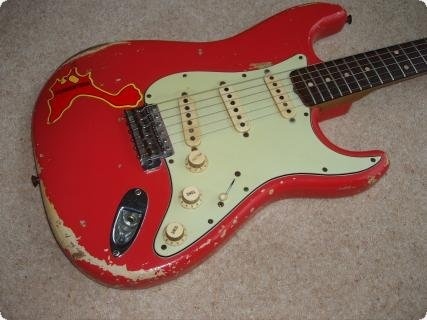 Decription: Fender Stratocaster 1962 in Fiesta Red this guitar we believed to have been owned by Chris Rea. This guitar has been in a private collection for many years. He had 2 of these Fiesta Red Strats with Motor Circuit Maps. The guitar is all original but shows much wear to the finish. If any fans have any more info or pics. it would greatly appreciated. It has a later case. So, it seems to be the twin Pinky Strat seen in 1985 RockPalast Lorelei video. It is told to have been in a private collection, so it was not Chris who put it on an auction. Last edited by andrew fischer on 27 Mar 2015, 16:22, edited 1 time in total. a big, big THANK YOU! I was about to doubt my memory but now I am sure I saw this very picture. One mystery solved - but it is still peculiar why Chris said that he lost one Strat in the "flood". Maybe this one was not sounding good anymore after the incident and so he sold - or traded it. At least this explains why he was never seen with two red Strats again. BTW here you can see a pic in high resolution of Pinky - 2006 state I suppose regarding the pickups, and with a new pickguard,as well. Interesting: it seems to me that Pinky was either produced in late '62 or early '63 - but not earlier because it already has a rosewood veneer fingerboard instead of a so called "slab board" (thick rosewood) only used until end of '62 - and not later in '63 because it still had the old position of the pickguard screw (second screw from above on the left). The picture you kindly provided only shows the body but I've watched some videos of the Rockpalast '85 gig and it seems that the other Strat was also a late '62 or early '63 model. The wear on the guitar body seems identical to the Strat he played at the Lorelei gig so I am pretty sure it was really this guitar he played in standard tuning. once again thanks for your activity and appreciation! For the flood aftermath - it still uncertain, whether he talked then of Pinky which survived, or this twin red Strat which he gave away. I know these HD pictures from Guitar Repair website, they provide a perfect close-up to see the detailed technical side of Pinky. Thank you very much again for precise production year detection, very good to know all these technical details. BTW, could you do the same detection of Bluey's year of issue? I was most impressed by his words on the "mysterious" dark brown battered guitar which he now uses for the live versions of Julia, Josephine, Morning Sun and some others. Great Andrey, thanks for the share. I was very pleased to read the part about the worn brown Strat. Now we know more about this guitar - at last.